What skills does a writer need to develop? 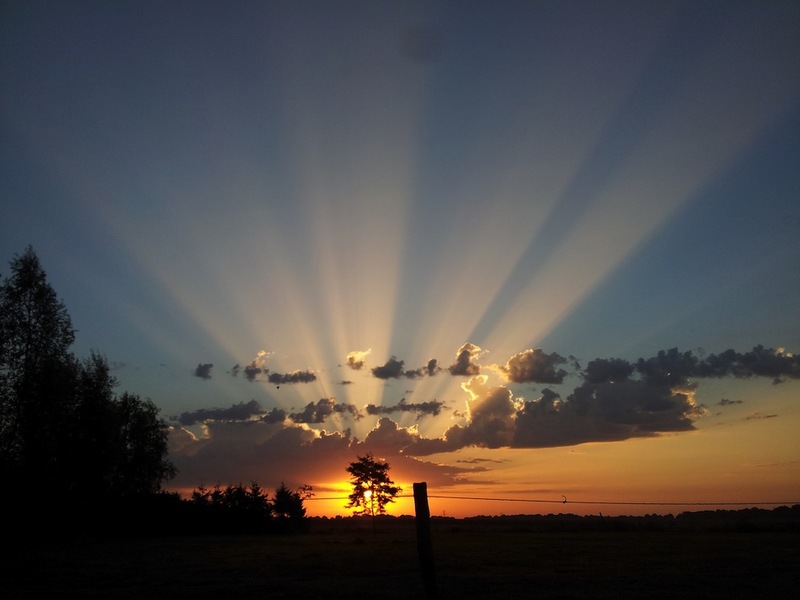 I found this beautiful picture of dawn/sunrise on the site of Boheems Paradijs (www.boheemsparadijs.nl), they own the copyright of this picture. Must be a beautiful place! On the 1st of July, we celebrate the abolition of African slavery in the Dutch colonies, officially declared on July 1st, 1863, and made effective on July 1st, 1873, when other cheap indentured labourers from India were imported to work on the plantations and lived in disguised slavery. 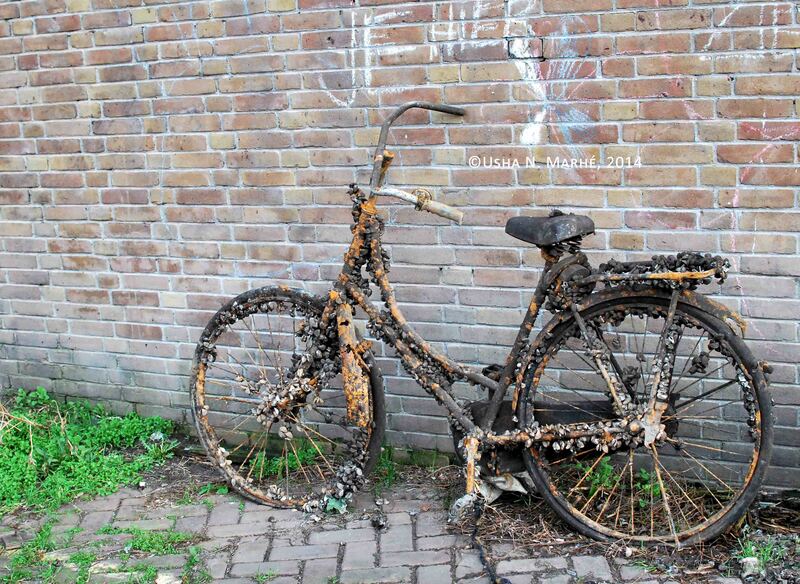 The chains are gone, but if you take a good look around in our Surinamese and Dutch society and in the rest of the world, you can see that mental slavery is a state of mind that is too common. The invisible chains in ourselves are powerful. Bob Marley (and so many others) told us: “Emancipate yourselves from mental slavery, none but ourselves can free our minds.” He knew, because he choose the red pill. So did I, and some other people I know personally, or that I know through their writing or art or actions. We look around and see The Matrix, and we see the chained minds around us. And we keep doing what we have to do, because there is no other choice once you have embraced ‘the truth’, firmly based in light and love. There are no escapes or short cuts for red pill people, like when you have taken the blue pill, which stands for escapism. My beloved birthcountry Suriname is full of people who have taken the blue pill, and persons who are in control of the blue pill factory run the country. And as we see in The Netherlands, England, the USA and many other societies, more and more CEO’s of the blue pill factory try to seize power and control. But everywhere, there are red pill people too! I know we make the difference. I know more and more people wake up every day. Because that is what live on earth is all about: to grow from unconsciousness to consciousness. In this life or another. Every day, when we wake up, we have the opportunity to make better choices, because that is the grace of life. A person who finally understood that, was the person that gave us the powerful hymn “Amazing Grace”. After he came into consciousness, he supported the abolition of slavery. And from his transformation into consciousness came the hymn that we know as “Amazing Grace”. It was published in 1779. And it is very popular among those whose African ancestors have endured slavery. When you think of it, you feel the power of transformation. And you get goosebumps, when you know the history and hear president Barack Obama sing it. He is a red pill person too. -Huh? I looked into the eyes of the Afro-Surinamese acquaintance who said this to me on a certain day somewhere in 2007. When or if you want to forbid a writer to use a certain word, you have to be very sure about the case you are making and arm yourself with outstanding explanation. -“Oh, why not?”, I replied dryly. 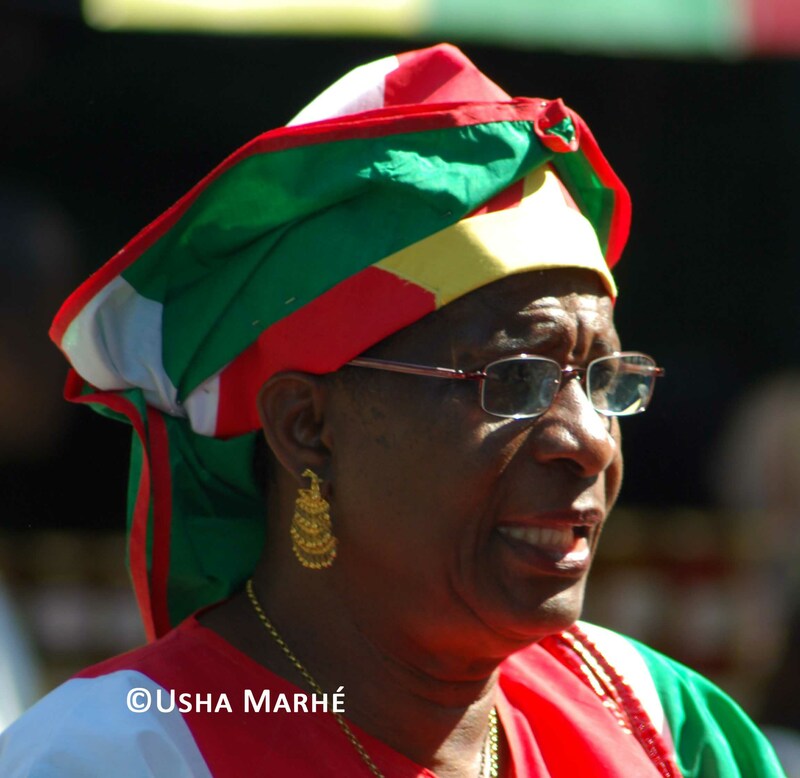 Circumstances have changed and people and language are dynamic: the word bakra has evolved into a common word in Surinamese lingua franca to refer to white people in general. In fact, it has become a referral to ‘white ethnicity’. ‘Bakra basi’ means ‘white boss’ or ‘Dutch boss’. During colonial time, the word was also used in local Surinamese newspapers. The fragment at the beginning of this article is a simple reproduction of a conversation that I didn’t forget because the explanation seemed to be coming from a feeling of victimization seeking to be healed, instead of being the result of proper knowledge of language. Although I had not thought about the origin of the word before, as a writer, my feeling and knowledge of languages combined with what I know about the history of my birthcountry Suriname made it clear to me that the given explanation could not be right. Nowadays, to me and many other Surinamese the word bakra has become a functional noun, just like other nouns as chair, television, bicycle, tulip. Naturally, after the conversation I wanted to know about the origin of this word, but it would take years before I would have the opportunity to investigate. About two months ago, the first clue almost literally fell into my lap, while reading the impressive historical novel ‘The Book of Negroes’, written by Lawrence Hill. 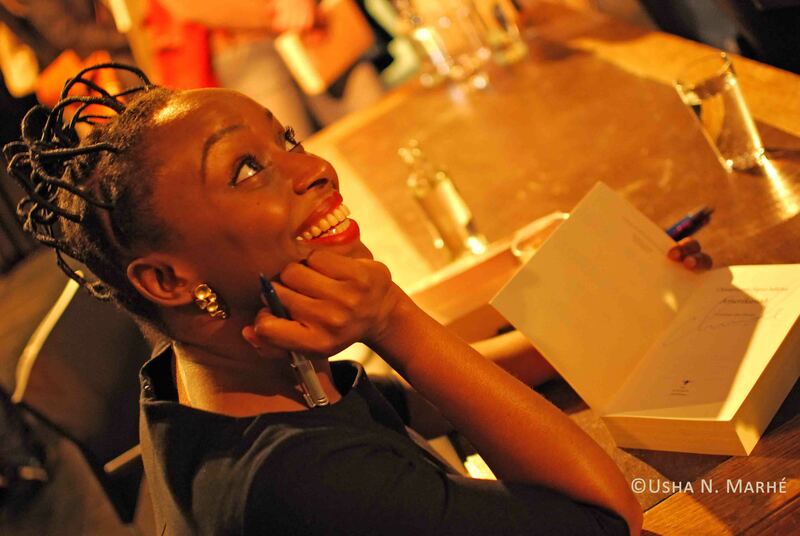 On page 126 [of the Dutch edition] Aminata, the main character of the story, who has been sold as a slave in Charles Town, is instructed by Georgia about the use of the English language and Gullah, the language that was spoken amongst the enslaved Africans in the USA. Georgia is her fellow sufferer who lives and works for a longer period of time on the same plantation and takes care of the young Aminata. 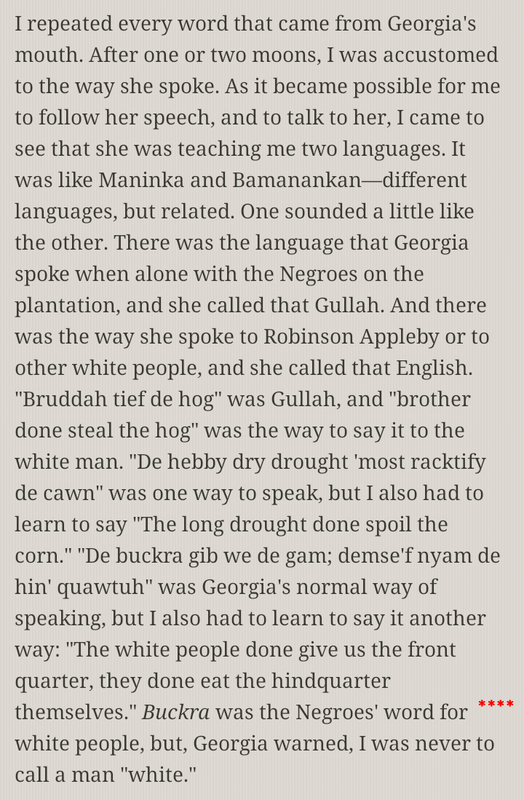 On that page 126 I found this sentence: Buckra was the Negroes’ word for white people, but, Georgia warned, I was never to call a man ‘white’. Buckra? Ha! To me, my eyes were reading the word bakra in a slightly different spelling and my tongue produced similar sounds while pronouncing both words. It was a big surprise to me to discover that this Surinamese word was also used in (mainly the southern states of) the USA and is still in use, just like in Suriname. I learned a lot more surprising details about the origin and spread of this word. According to different sources, buckra or bakra as we know it in Suriname, is derived from the word ‘mbakara’. Wikipedia mentions: Buckra is primarily used by African-Americans in the Southeast United States to describe a white man or a boss. It is generally thought to derive from a word in the Efik and Ibibio languages, “mbakara”, meaning “master.” I found another explanation about mbakara, that added more knowledge, with the same reference to buckra, in the notes of the book The Politics of Taste in Antebellum Charleston written by Maurie D. McInnis. Buckra is also a well-known word in Jamaica. 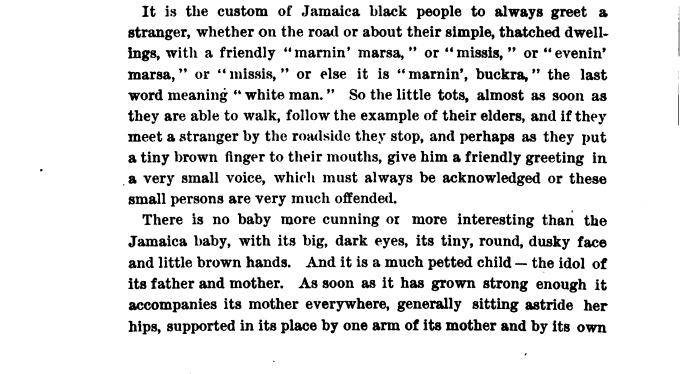 An extensive explanation about the original home cities of the enslaved Africans in Jamaica can be found on Wikipedia, and also about the different original African languages they spoke. Buckra is explained as following: “Buckra” was a term introduced by Igbo and Efik slaves in Jamaica to refer to white slave masters. 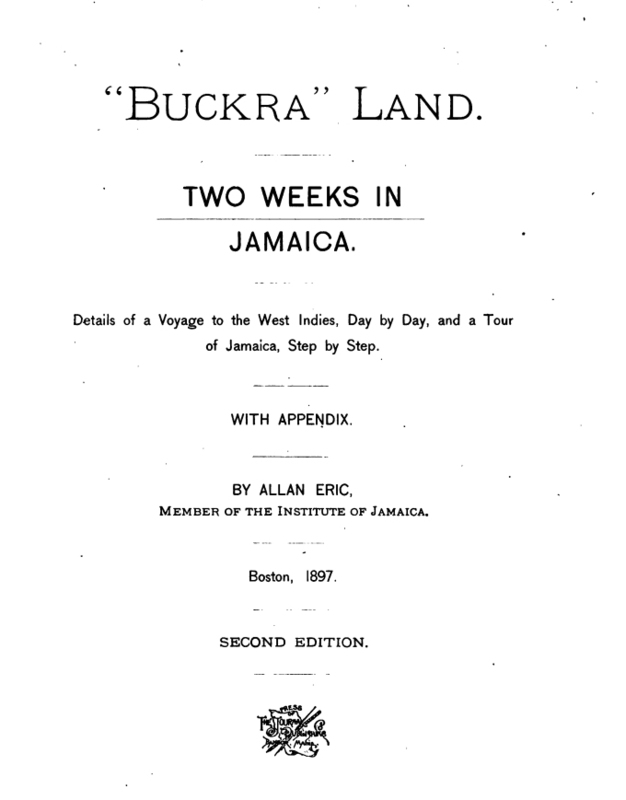 The word was so well-known during the English colonization of Jamaica, that a book about Jamaica was published in 1897, with the title Buckra land, written by Allan Eric, member of the Institute of Jamaica. On page 18 I found the following fragment, where the author mentions the word buckra and explains that it meant ‘white man’ in Jamaica. The two meanings of mbakara are explained on Wikipedia and in the book Voice of the Leopard: African Secret Societies and Cuba written by Ivor L. Miller. My quest for the origin of bakra and buckra is about the second meaning of ‘the Efik word Mbàkárá’, as found in Miller’s book. This explanation also refers to the language of the Efik. In Africa, these ‘Efik people’ who are mentioned in different studies, were, according to the explanations, ‘the middle men between the white traders on the coast and the inland tribes of the Cross River and Calabar district.’ Because of their ‘middle men’ position, apparently their language had an important influence in establishing the contact between the different groups of slave traders, slave sellers and the enslaved, on the African coast and on the slave ships. The work of Mervyn Coleridge Alleyne provided me with the link I searched for between the words bakra, buckra en mbakara. Alleyne, born in Trinidad, is a sociolinguist, creolist and dialectologist who researched the ‘creole languages of the Caribbean’. Sranan (Surinamese) and Saramaccaans (another Surinamese language which is spoken by descendants of enslaved Africans who fled the plantations), the Jamaican Creole and the Guyanese Creole were part of his research, of which the results are published in his book ‘The Construction and Representation of Race and Ethnicity in the Caribbean’. In the subchapter ‘The system of Representation’ he explains the different names and there we see the word bakra again, derived from mbakara. 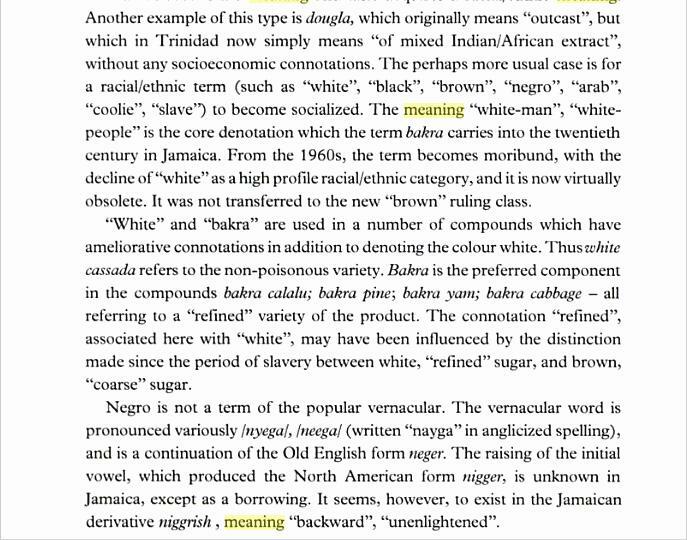 Alleyne also explains the change of the use of the word from a ‘socioeconomic meaning’ into ‘ethnic meaning’. The results of my quest to find the origin of the Surinamese word bakra, in English regions known as buckra, lead me to the conclusion that this word is not a unique word only known to Surinamese people. On the contrary, it has a rich history that started centuries ago on the coasts of Africa that connects many countries and peoples to each other. The word is derived from the Efik word mbakara. 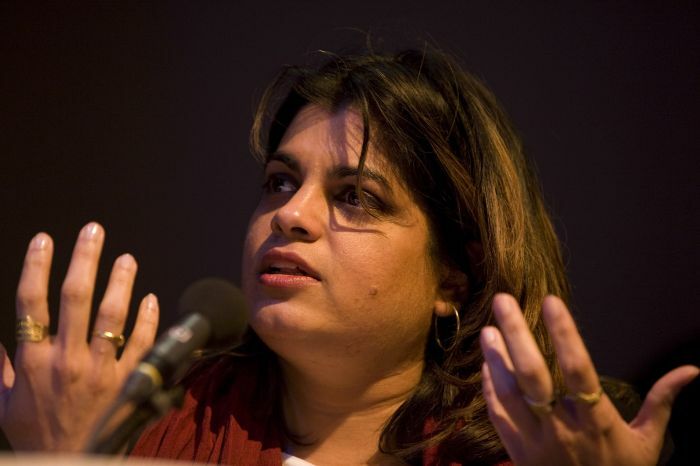 Considering the explanation about the original languages of the enslaved Africans, it has travelled from Africa to all the places in the USA, South America and the Caribbean where enslaved Africans were sold as merchandise and had to work on the plantations and where they kept using the word bakra/buckra as a referral to their ‘white boss’. Filmmaker Frank Zichem has made a documentary, named ‘Katibo Yeye’ (katibo = slavery), in which he travels from Suriname to Ghana with an Afro-Surinamese man to find his roots, and then back to Suriname, bringing a Ghanaian man with him, who doesn’t believe things he hears about African slave trade and slavery. This Ghanaian man almost bursts into tears when he hears the language of the Coromantee in Suriname, which is his own language. Because of the language he finally believes what has happened. Two fragments of the documentaire can be seen through this link. Except about the origin of these Surinamese Coromantees, almost nothing is known about the countries or regions of origin of the Afro-Surinamese people. Which is another reason why finding the origin of the word bakra/buckra is so interesting: it might be a big clue for Afro-Surinamese people in search for the regions of origin of their African roots. Sholay. This movie about courage, friendship and love made quite an impact on me, when I first saw it as a little girl at the age of ten. Because of that, it probably always will be in my top three shortlist of favourite Indian movies. The song ‘Yeh Dosti, Hum Nahin Torenge’ (This friendship I will never break) is an ode to the true depths of real camaraderie, or to say it in a hipper word: brotherhood. 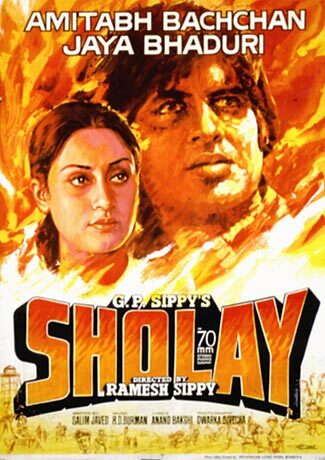 Sholay was a big success and also the movie that was Amitabh Bachchan’s breakthrough with an international audience. The combination of his tall, lean body, his thick black luscious looking hair and the code of forgotten honour he brought so well through his roles in movies made women fall for him by bundles. For men he was their new role model: they wanted to be (as) him, also to enhance their success with women. Amitabh sure brought new life to romance. I saw the movie in a cinema with the name De Paarl (The Pearl), in Paramaribo, the capital city of my birth country Suriname. The management had to put extra chairs in the walking isles between the seats. Too many tickets were sold: they didn’t want to disappoint the crowd that put on their best clothes to go meet & greet in the cinema on this Sunday afternoon. Because that was what going to the cinema mainly meant in Suriname, before the curfew of military dictator Bouterse in the eighties, in combination with the arrival of the then new video player, destroyed many of the cinema’s and the social life it brought to the city. Cinema De Paarl has been rebuild and now houses dancing Zsa Zsa Zu. But then long rows of pretty dressed grown ups and children stood in front of the ticket boot, almost every weekend. It was wise to come earlier, so you could be sure to get a ticket. Also, you had the time to meet friends and family, to buy soft drinks or chips. Or if the movie was in the chique Cinema Star or the then new and hip Cinema City, enjoy the feeling of being in the cinema, standing in the hall. Can you imagine how I felt, when I had the chance to interview Amitabh himself, in the Krasnapolsky Hotel in Amsterdam, about seventeen years after swooning as a ten year old in De Paarl? Never imagined or dreamed that this ever could or would happen; it’s almost indescribable how all kinds of experiences and environments came together, in those moments. That day I finally concluded that I had made a good move travelling the road of journalism. As a remembrance of the interview I have four black and white pictures caressing the walls of my home: two of me with my Amitabh, and two of him alone. My piece was published in a national Dutch paper, and was reprinted in Suriname’s daily paper De Ware Tijd; it was certainly big news that one of Suriname’s own journalists had an encounter with this idol. 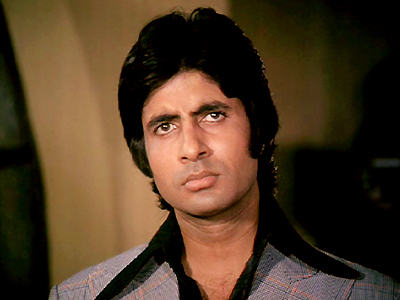 After Sholay he became The Big B.: a trademark for Indian cinema, a gauge for success. In the later years of his career he started making social committed movies like Black with Rani Mukherjee. You can say a lot about him, but not that he is a dull person. He lives life to his fullest potential.